Facebook lets us upload photos and videos to share our daily activities, interests, backgrounds or real-life connections. The good news is you can upload videos to Facebook in a way similar to that of photos. The bad news is video uploading causes issues on Facebook that photo uploading may not due to availability of different video formats but the limited video format supported by Facebook. If your Facebook reports a problem when uploading video to it, just read the article and find the tips of the best video format for Facebook uploading. - Freely transcode among 370+ formats, such as MKV to FLV, AVI to MP4 etc. - Easily compress (4K UHD) videos for Facebook without noticeable quality loss. 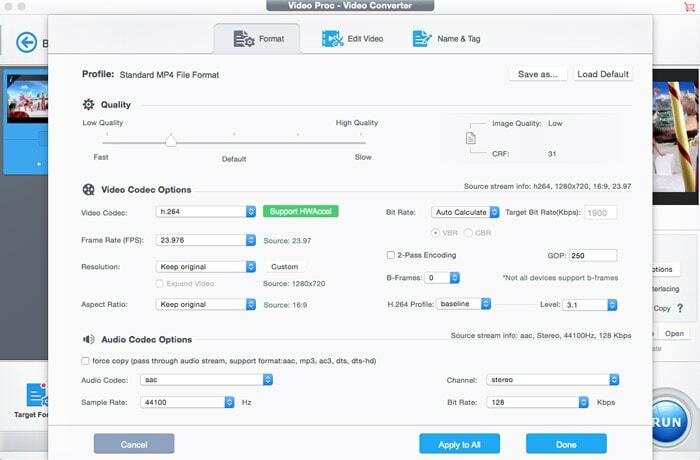 - Adjust video audio settings like aspect ratio, frame rate, bit rate, sample rate etc. - Save videos from YouTube, Vimeo, Dailymotion, Instagram 1000+ sites to FB. Feel uncertain about the best video format to upload to Facebook? What video formats do Facebook accept? Does Facebook support HEVC/H.265? 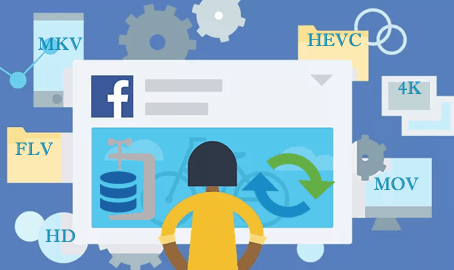 Reportedly, Facebook supports almost all video file types, but HEVC is currently not on the list of Facebook format. Below is the Facebook supported video format full list. To be frank, the video format is just the one of the factors impacting on the Facebook uploading. Knowing the best video format that Facebook supports is just the first step for a smooth video uploading to Facebook. There are other settings like codec, resolution, aspect ratio, bitrate, frame rate, etc you will need to know before you go the video upload process. The following best Facebook video and audio settings are listed if you want to go into deep study about the best video format for Facebook. The best format to upload to Facebook is H.264 video with AAC audio in MP4 or MOV format. It currently gives you a great bang for your buck in the file size to relative quality ratio, offering the best video compression available, and due to the file size limitations in Facebook, this format is the optimal choice for Facebook video. And there's no need to change the parameter during Facebook uploading. Use a file with the larger edge of the video constrained to 1280px. If your video is less than 1280px in size on the larger edge, try to keep your dimensions to multiples of 16px for best compression. Usually videos have the best quality if the frame rate is between 25-30 fps. So you are recommended to keep the frame rate of your video at or below 30fps. The aspect ratio of the video must be within the range of 9x16 to 16x9 which most videos should have, and the video exceeding the file size or length that the upload page suggests will be rejected. Additional restrictions are in place that may prevent you from uploading videos in supported formats. Here are some additional but indispensible tips for the supported video format for best Facebook uploading result in addition to being aware of the best video format like MP4 supported by Facebook. 1. Make sure your video doesn't exceed the size or the time limits you see on the upload page. The maximum file size is 4 GB, while the video duration should be less than 120 min. Remember the longer the video is, the larger file size it will be. 2. Check whether you are using the latest version of supported browsers like Mozilla Firefox, Safari, Google Chrome, Internet Explorer, and Opera. By the courtesy of the the abovementioned supported video formats and settings for Facebook website, you'll surely get the optimum Facebook video uploading result. Since Facebook now enables users to upload 360-degree VR videos for sharing in an immersive way, here in the following section, we also list the best Facebook video format and settings for VR 360-degree videos. •	Video duration: Less than 6 minutes. 3. Video should be playable in possibly all media players and websites. 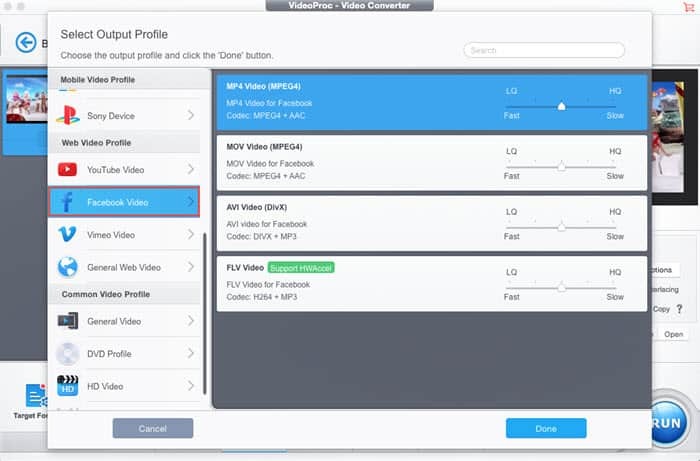 While MP4 is not only the video format supported by Facebook, YouTube, but also iOS, Android devices, and maintains a perfect balance between the video quality and size, which many other files like FLV, AVI, WMV, MKV, etc cannot do. Note that you should also check the codec format. Some videos are in MP4 container format with HEVC codec or other codec format unaccepted by Facebook, such as GoPro 4K footages and iPhone MP4 4K HEVC clips. In such case, you have to change the codec format. Tips: If the video you want to upload to Facebook is not in the compatible video format list or if facebook videos won't play on iPhone iPad, you will need to take some time to convert the video files you upload into the best video container/codec format for Facebook uploading via a professional video processing program. Step 1: Download and run the Facebook video converter on your computer. Click Video > + Video, and select the source footage. The Output Profile window will pop up, offering output video format options. Step 2: Go to Web Video Profile > Facebook Video, and select an output format from the list, and click Done button to save the settings. Step 3: Click the codec Option button to show more video settings options. It allows you to adjust video quality, resolution, aspect ratio, audio sampling rate, audio channel, and other video audio settings for Facebook sharing. Step 4: After you've all set, click the RUN button in the bottom right corner to start processing videos for posting to Facebook in a blazing fast speed thanks to the powerful Intel QSV/Nvidia/AMD hardware acceleration tech supports. - Cut, trim out unwanted slices and change your video the best duration with all the highlights reserved for Facebook. - Split a long footage to separate parts for uploading to bypass facebook video sharing limit on length. - Merge clips to a whole new video for better viewing experience. - Add effects and filters, rotate and flip, and post-process videos to polish them for more views and likes. Fix Your Facebook Videos Playing with No Sound! Save videos in 4K UHD from YouTube quickly in batch. Rip audio from YouTube video with original quality. Capture streaming videos from 1000+ streaming sites. Transcode YouTube video format to MOV format.